The safety of Bangladesh's garment factories is again in the spotlight five years after the worst industrial accident in the country's history. But on 31 December 2018, one of these projects winds up its operations. It's important to say there are many more production facilities not regulated under any of these safety arrangements. There have been significant improvements to factory safety since the internationally backed schemes began sending teams of experts - both local and international - to address fire, electrical and structural concerns. 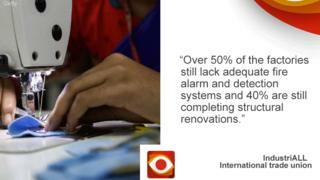 The country director of the ILO in Bangladesh, Toumo Poutiainen, told BBC News there had been "significant gains in safety". Its latest progress report states that 188 factories have completed all the work identified after initial inspections, with a further 1,220 factories behind schedule in making improvements. And of a further 745 factories which fall under the Bangladesh government's initiative, only 218 had completed over half the safety improvements required by November this year. Commerce Minister Tofail Ahmed told the BBC that "the RCC is ready to take over and we are now experienced enough to do the inspections ourselves". IndustriALL Global Union - one of the signatories to the Accord - has put out a statement voicing serious concerns. The union's communications director, Petra Brannmark, told the BBC that the RCC "is still at early stage of development" in terms of its capacity. "There is no proven track record of enforcement of the law against non-compliant factories," he told the BBC. But it's clear that garment factory owners - an influential group in Bangladesh - have become increasingly frustrated with the internationally backed Accord. A recent piece in the English-language Daily Star entitled "Accord: Blessing turns to a burden" describes what they see as unreasonable demands for safety improvements. The factories operate on tight margins to meet the international brands' desire to keep costs down. H&M told the BBC they wanted to see a proper timeline for a "smooth and progressive" transition until the locally run safety monitoring system is "fully ready". But at the moment, there's no agreement as to when that might be.